Buffalo River Musings: The Erbie recreation area provides access to the Buffalo River Trail and historic sites. 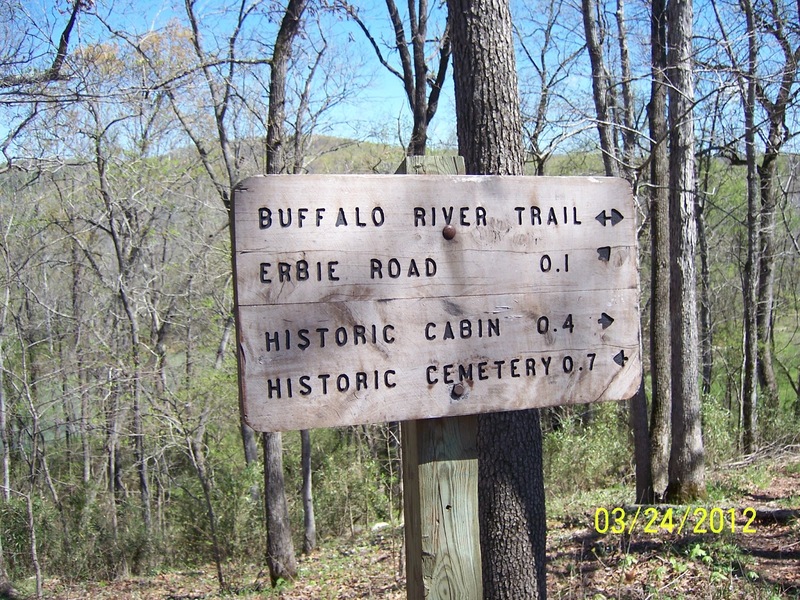 The Erbie recreation area provides access to the Buffalo River Trail and historic sites. 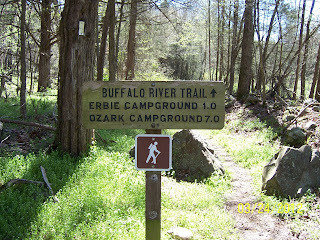 The Erbie access area to the Buffalo National River is about 8 miles off State Highway 7 on a graded dirt county road. The turn off is between Jasper and Pruitt. The road is pretty well maintained, but it's a little bumpy and rough in a couple of spots, and there are some narrow passages where you don't particularly want to meet another large vehicle. 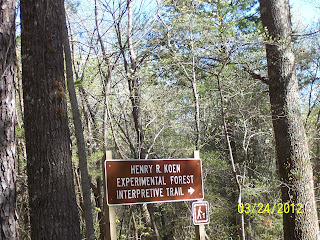 After turning on the road to Erbie, you will soon come to Henry R. Koen Experimental Forest Interpretive Trail on the right. A little further down, you will come to the Koen Research Center building. 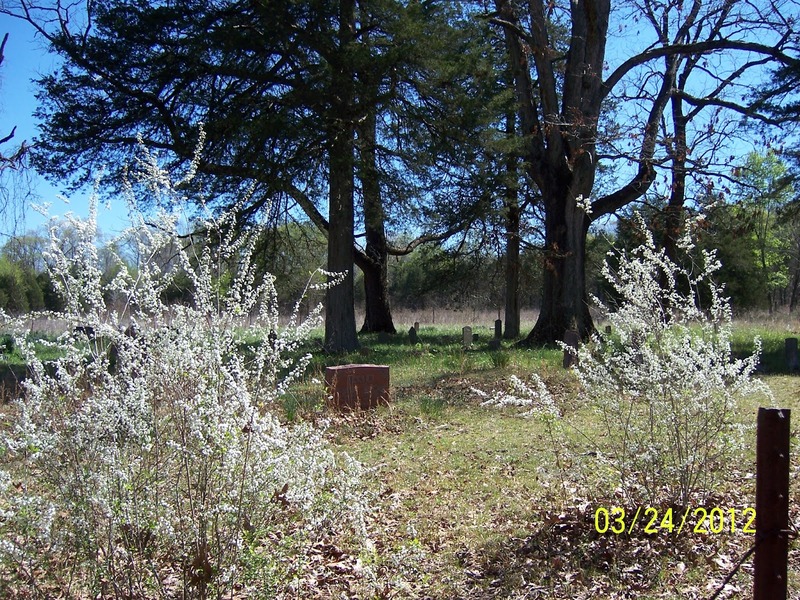 The next noticeable landmark will be Cedar Grove picnic area on the right, followed next by the small Brown Cemetery on the right that is fenced with a sign. The twisty, turning road continues several more miles. About a mile before reaching the river crossing, the Erbie recretaion area entrance will be on the right. 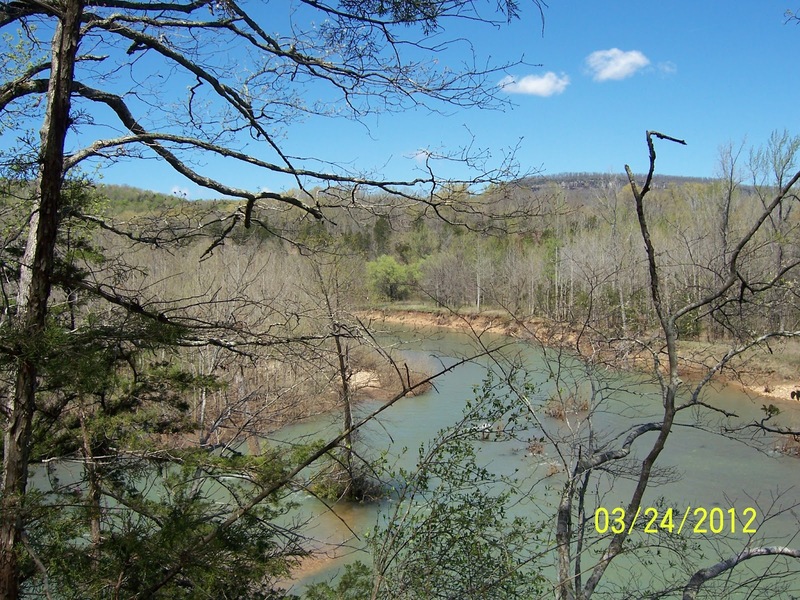 There is a separate river access area (keep to the right) and some camping areas (keep to the left). 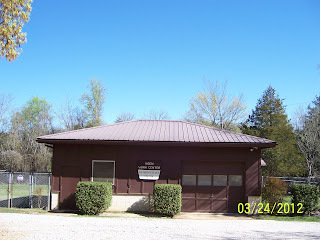 There are several restroom facilities in the park, as well as drinking water locations that are signed. This map is located at the river access parking area. Pruitt begins at the edge of the river access parking area. 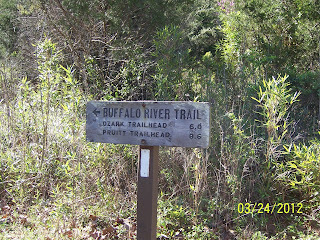 This trailhead begins at the walk-in tent camping area. From the river access on the right, the Buffalo River Trailhead is found by the top parking lot. 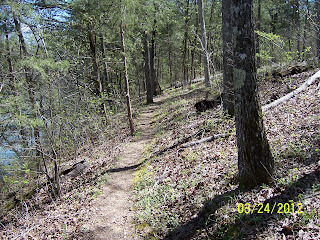 The trail runs from this point to the Ozark access area and then further on to the Pruitt access area downstream. 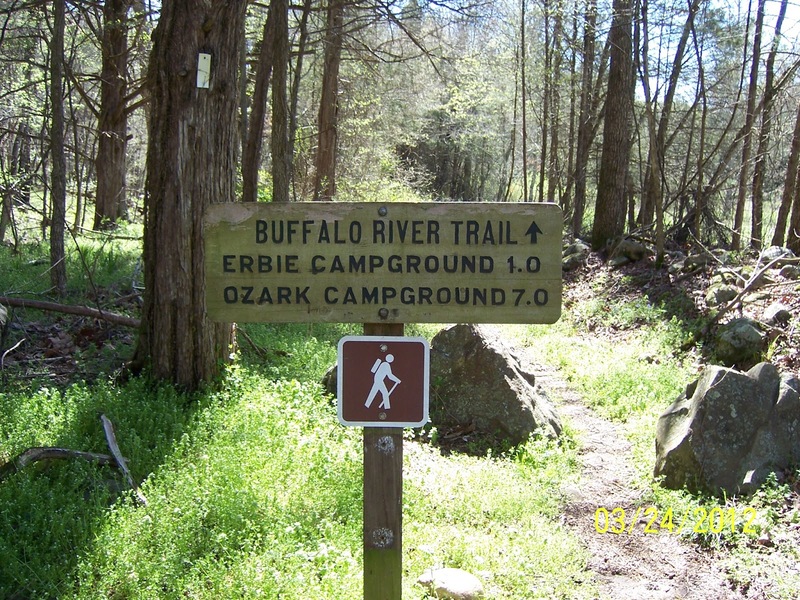 If you turn left into the campground area, you will find the Buffalo River Trailhead that leads in the opposite direction. 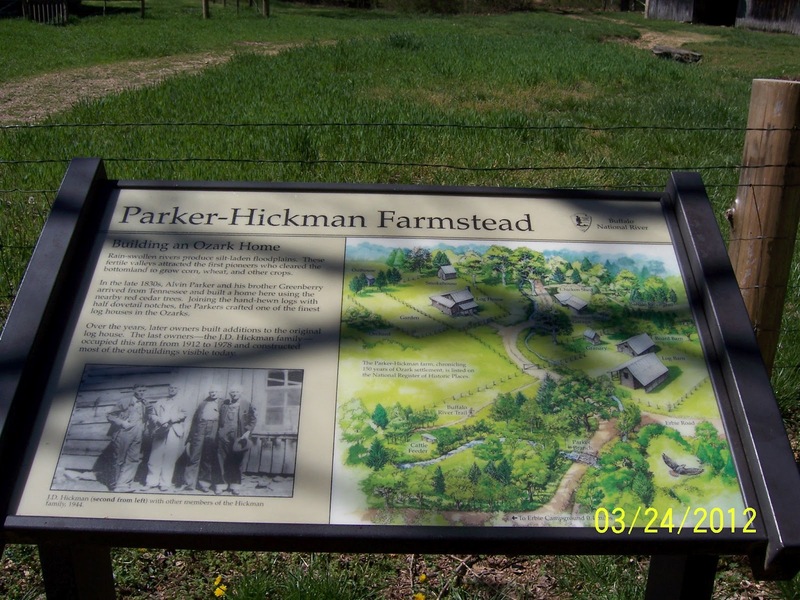 If you head down this trail, you will come to the Parker-Hickman Historic Farmstead that has been preserved by the National Parks Service. 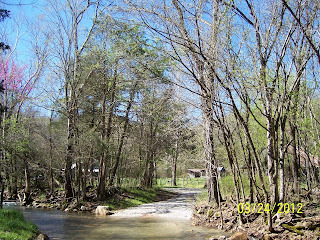 You have to cross a creek just at the farmstead boundary. 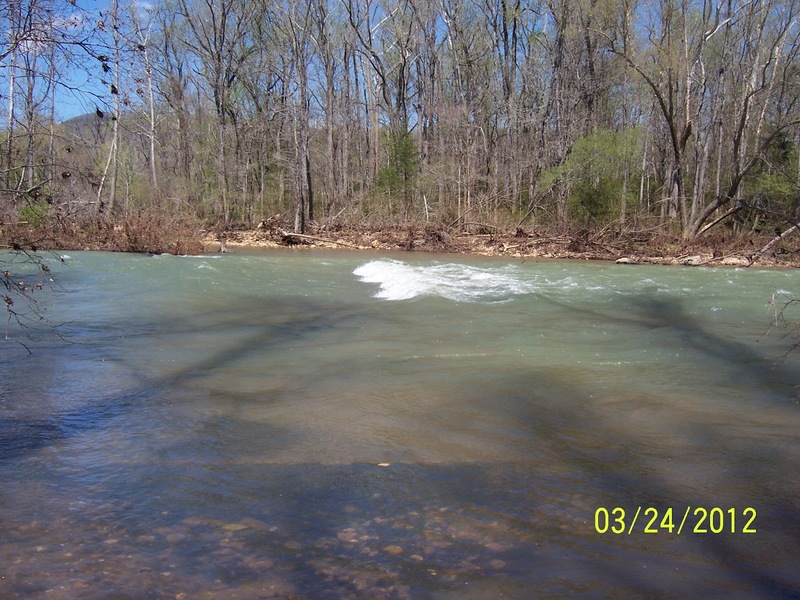 If the water is very high, you may not be able to walk across. 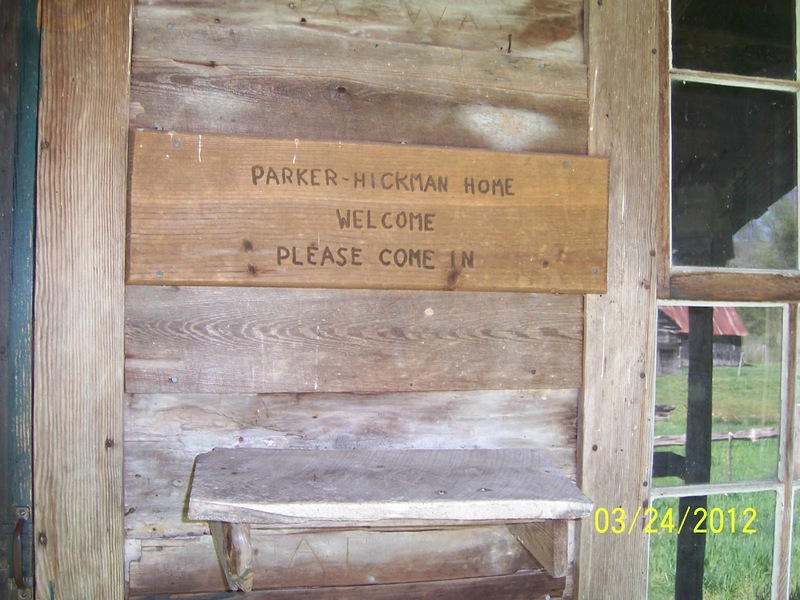 You will also come to the Parker-Hickman Historic Farmstead if you continue driving on Erbie Road, past the entrance to the campground and on toward the river. 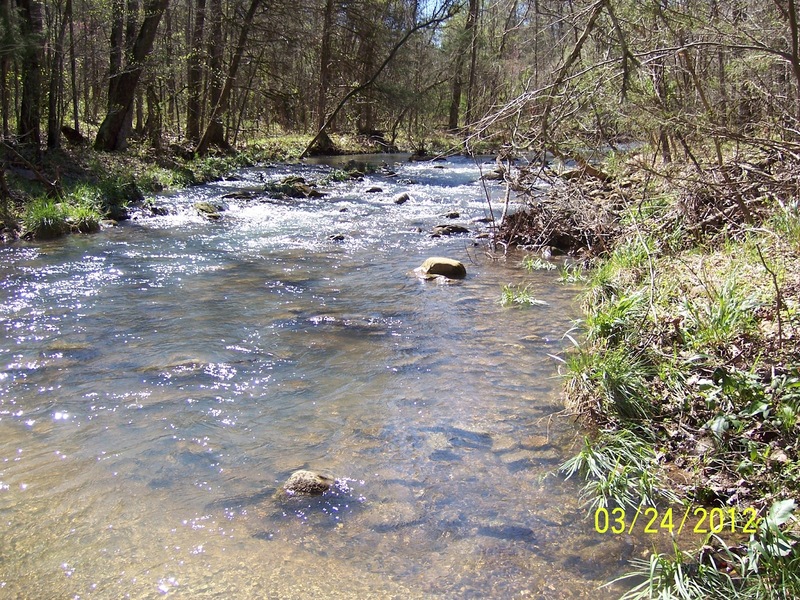 You should have no problem crossing the creek in a car or truck unless the water is extremely high after a flood. 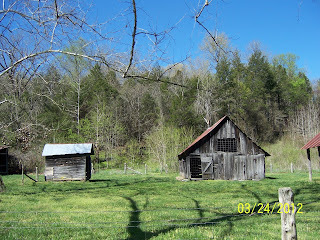 You can park at the homestead and look around all you want. 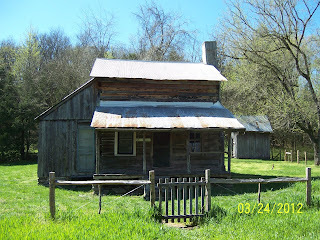 In addition to the old house, there are also several outbuildings that are standing. 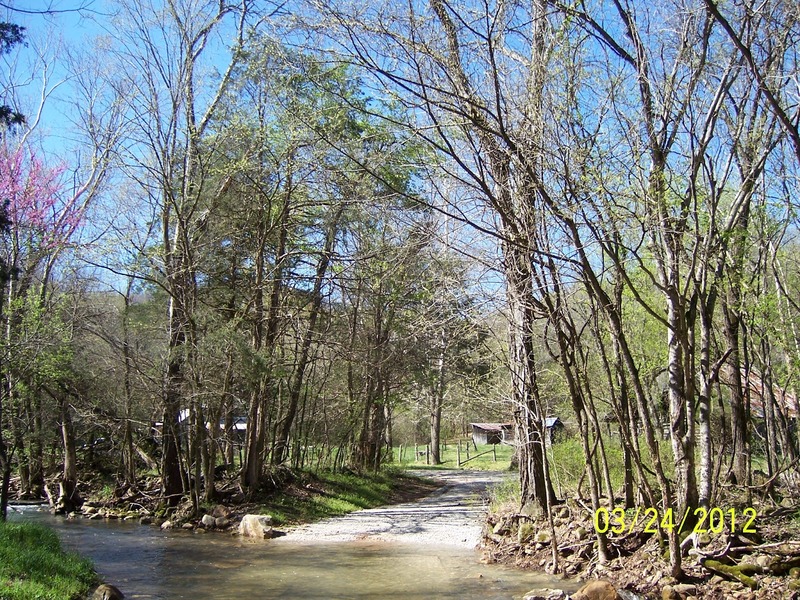 Creek crossing approaching the Parker-Hickman Farmstead. 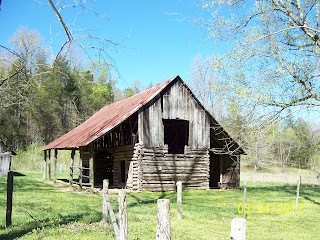 Barn at the Parker-Hickman Farmstead. 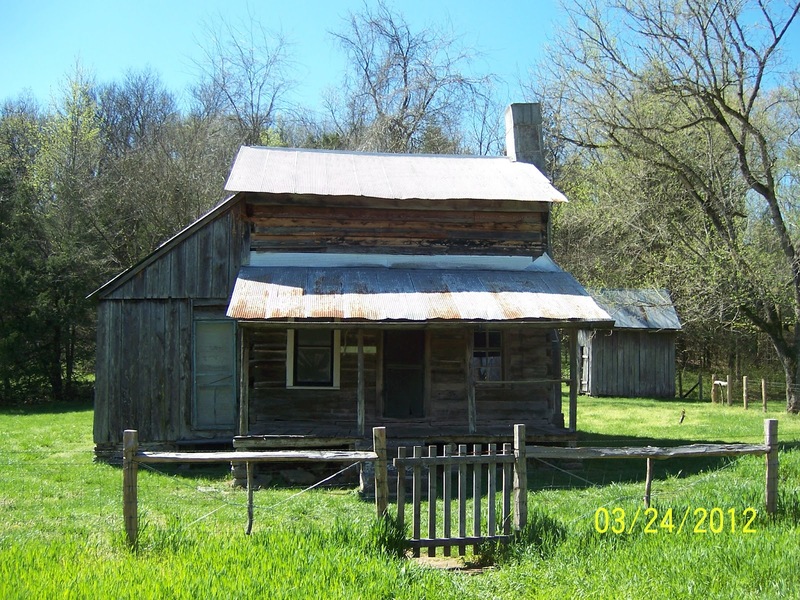 The historic home is open for inspection. Just to the left of the parking area, there is another signed portion of the Buffalo River trailhead that leads away from the farmstead. 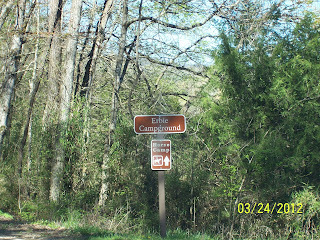 This will circle back to the Erbie campground and then on to the Ozark recreation area. 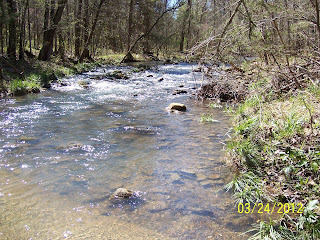 This route also requires a creek crossing not far from the parking area. 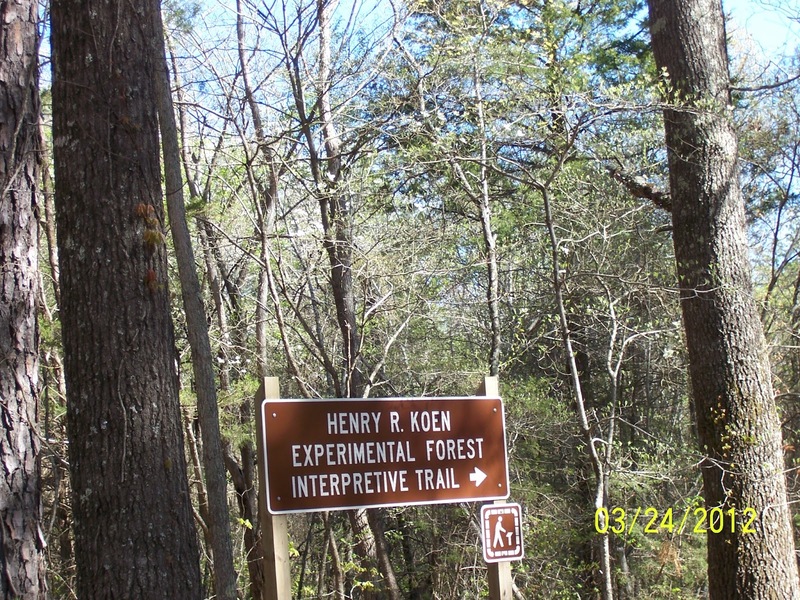 This is NOT the correct trail if you are looking for the historic Cherry Grove cemetery. The other connection of the trailhead leading in the opposite direction from the farmstead must be close by, but I did not see it. 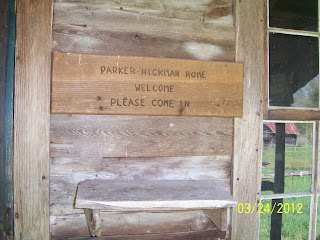 This trailhead is to the left of the Parker-Hickman home. This is NOT the trail leading to the Cherry Grove Cemetery. 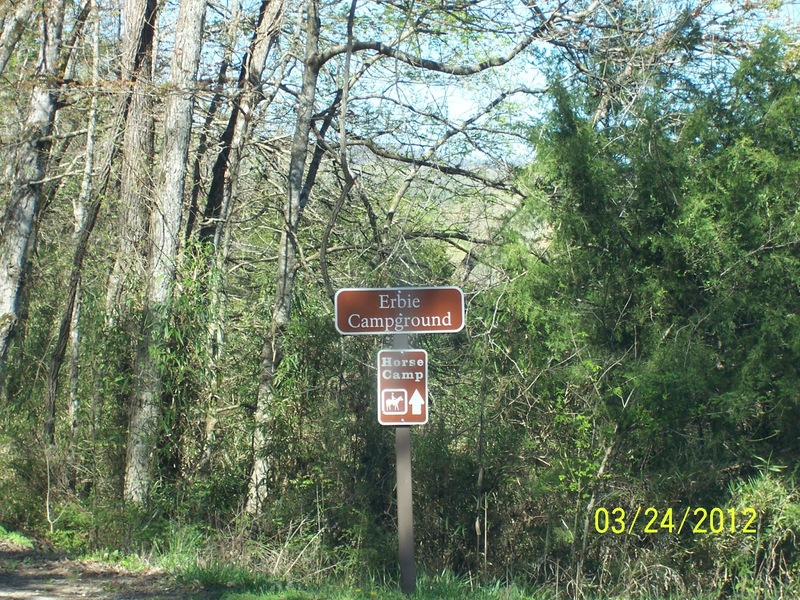 After leaving the farmstead parking area, you can continue driving (or walking) down the Erbie road toward the river. 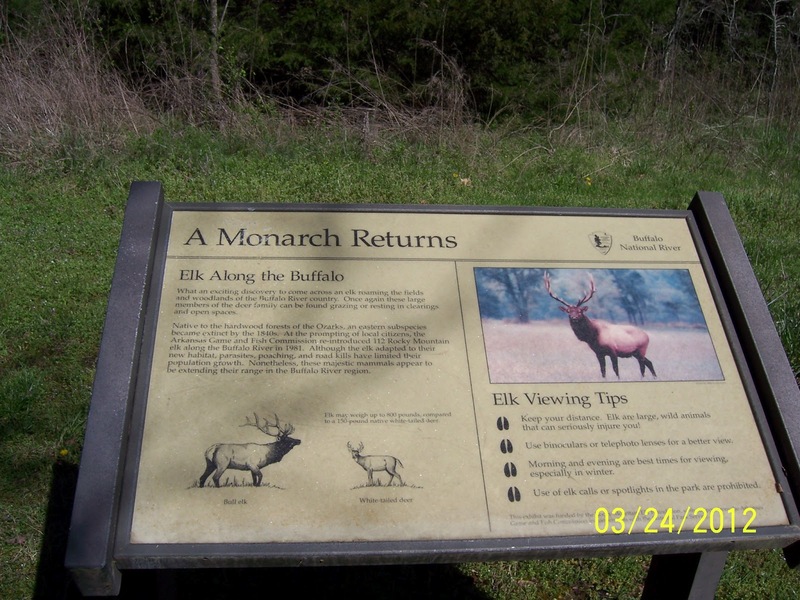 On the left will be a parking area with another Buffalo River trailhead sign on the left in front of a large open field. 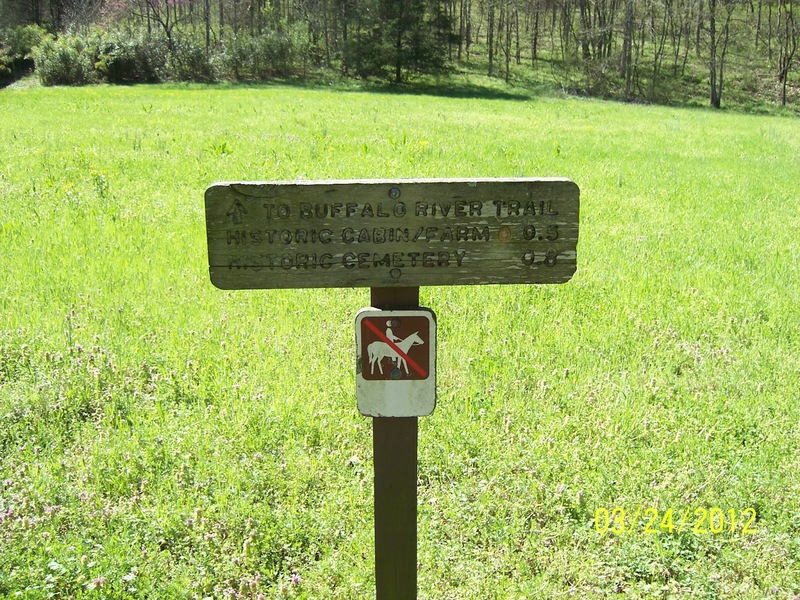 If you cross the field in the middle, directly in front of the sign, you will come to an old road leading up a hill, bearing to the right. There is another large open field to at the top. 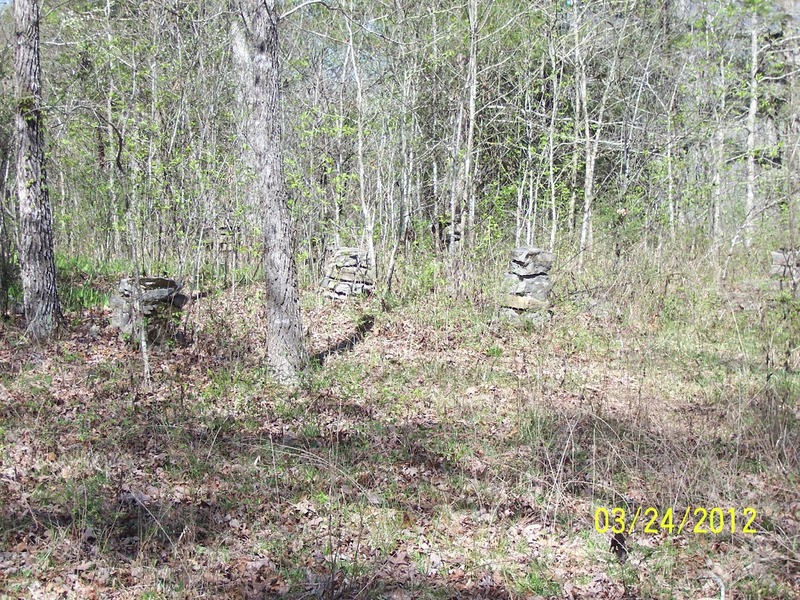 If you walk down the woodline on the left, across the field, you will find the other end of the road, which is blocked with a gate. Walk past the barricade and continue. A short distance later, the road will split. The road to the left goes down a hill back in the direction of the Parker-Hickman Farmstead. 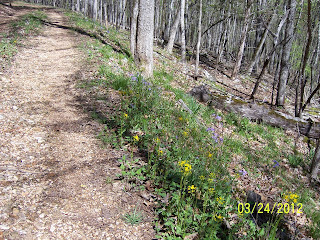 The road to the right goes along the edge of the hill for about a mile (this road is not part of the Buffalo River Trail). There are no signs where the roadway splits to tell you which direction to go. 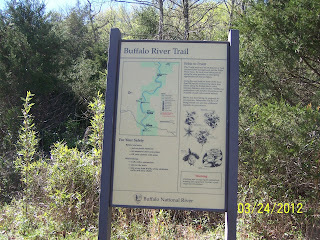 If you go to the right, you will join up with the Buffalo River Trail on the left after about a 3/4 mile or so walk. 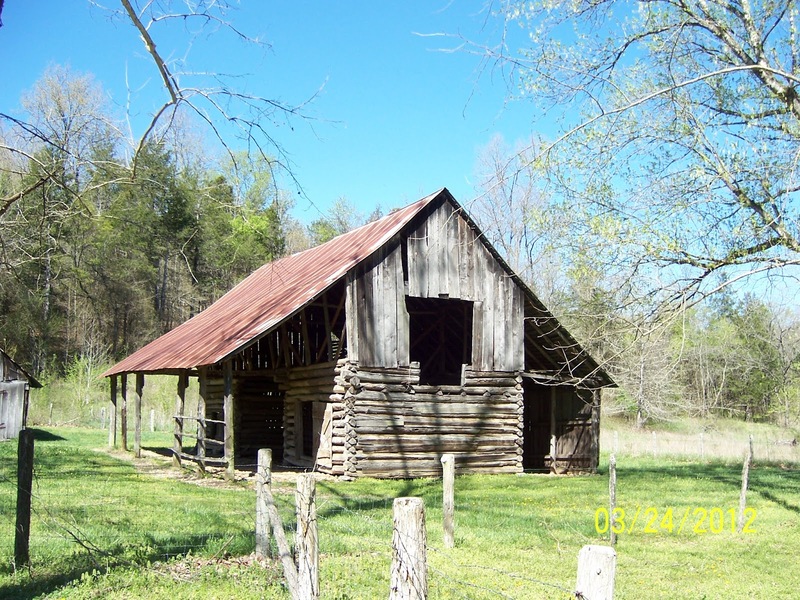 Continue on this same roadway, down the hill, and in a short distance you will come to the historic Cherry Grove Cemetery on the right adjacent to the roadway. I saw old photos of this cemetery that included signing for it, but as of March, 2012, there is no sign visible. or cross in the middle to an old road leading up the hill. 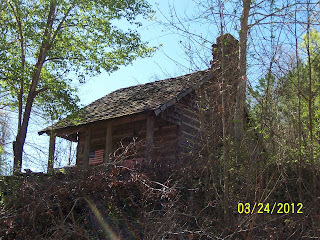 top of the hill along the old road. 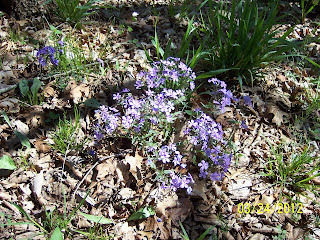 Wild phlox blooming along the old road. 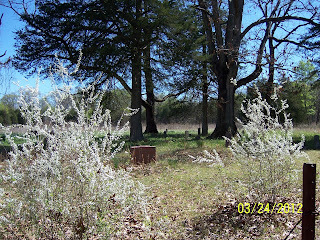 Entrance to the historic Cherry Grove Cemetery. 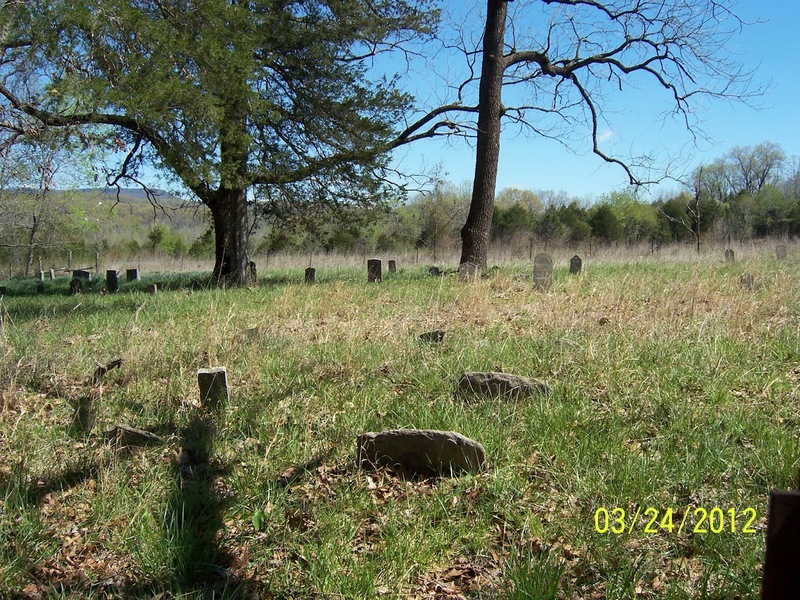 Another view of the Cherry Grove Cemetery. 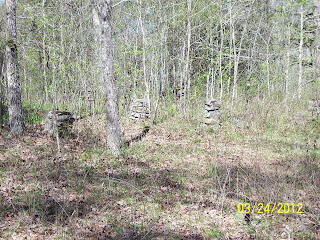 Just down the roadway from the cemetery is another gate. 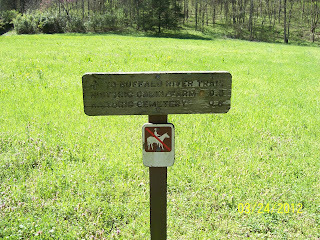 Walk past this gate, down the hill, and there will be another sign indicating that the Buffalo River Trail veers off to the right of this road. The trail is just a foot path through the woods. 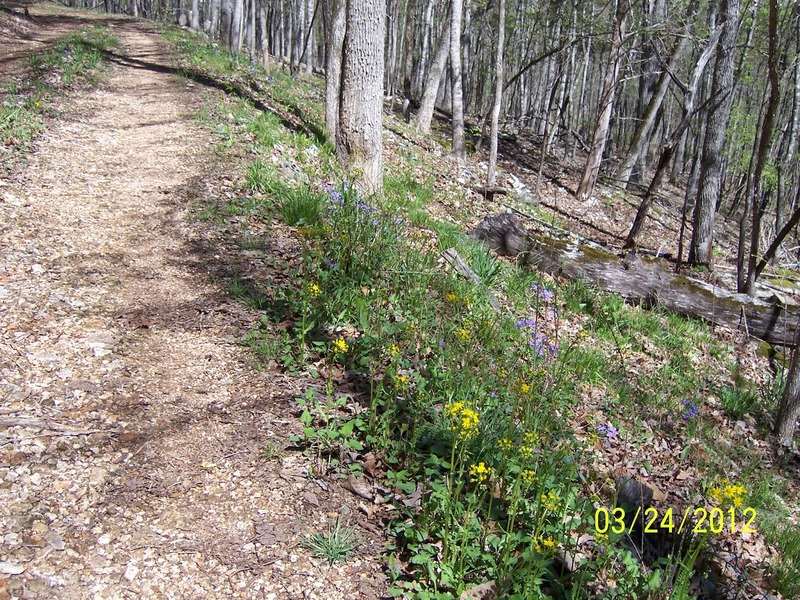 If you take this trail, you will come to some pretty good views of the river below. 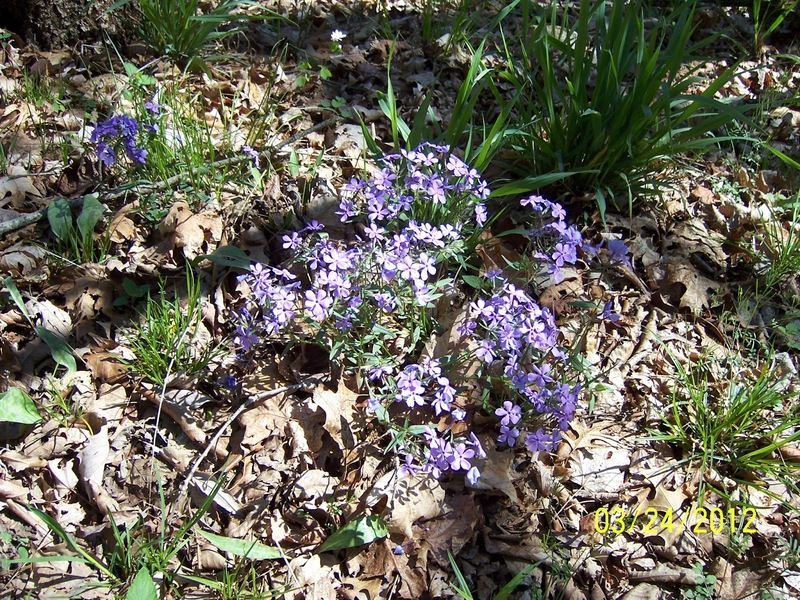 The trail can be muddy and slippery after a rain. 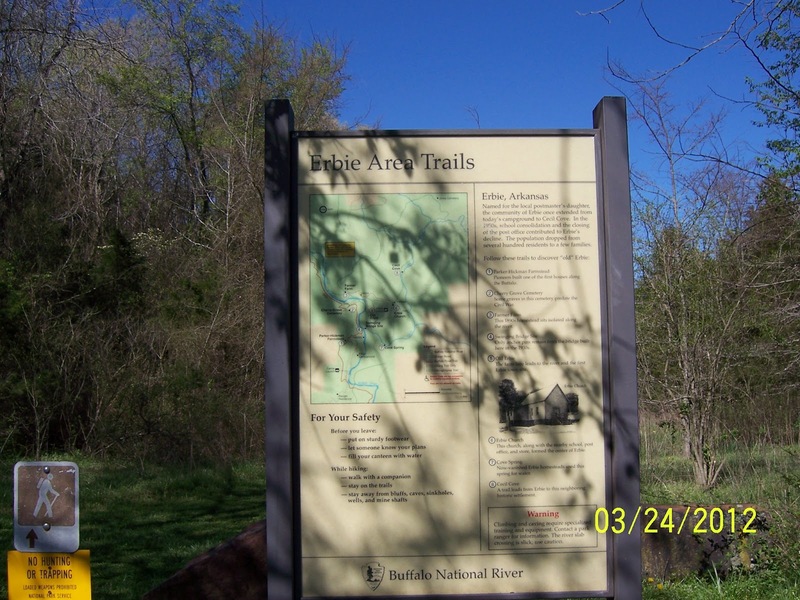 After about a mile, the trail returns to the same large field at the parking area on Erbie Road. In essence, you just end up making a big circle of about 2 miles if you take this route as I did, which brings you back to where you parked at. Erbie Road from the area of the cemetery. 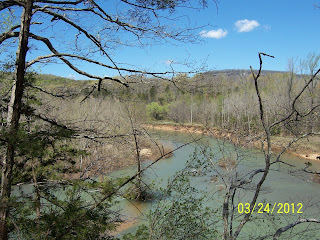 A view of the beautiful Buffalo National River from the trail. level was too high to cross on this day. 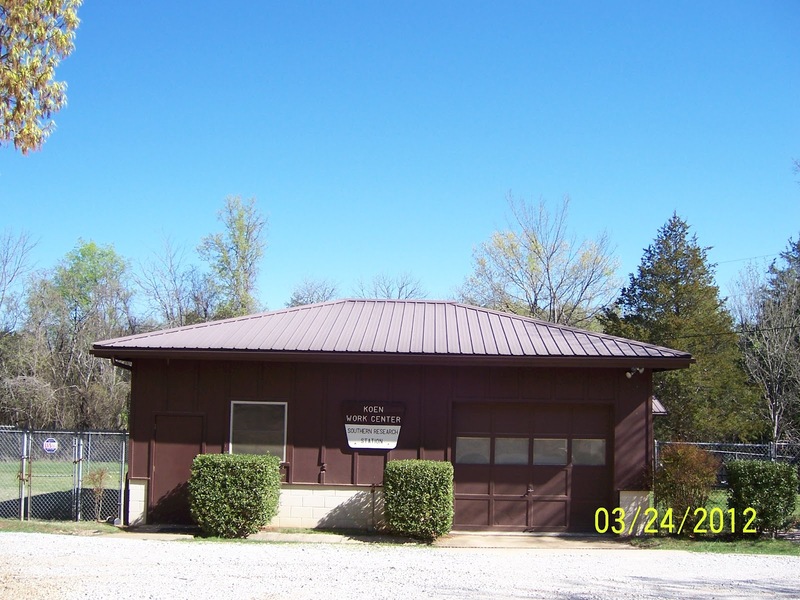 and re-enter Arkansas State Highway 7. If you continue another 1/4 mile or so down Erbie road, you will come to the river and the low water crossing. 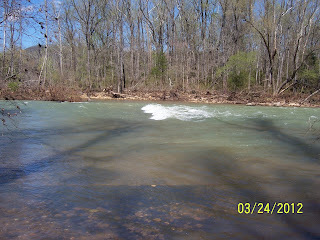 When I was there, the water was flowing rapidly and far too high to drive across. Nothing left to do but turn around and head back, then on the Jasper for a great burger at the Ozark Cafe on the town square.